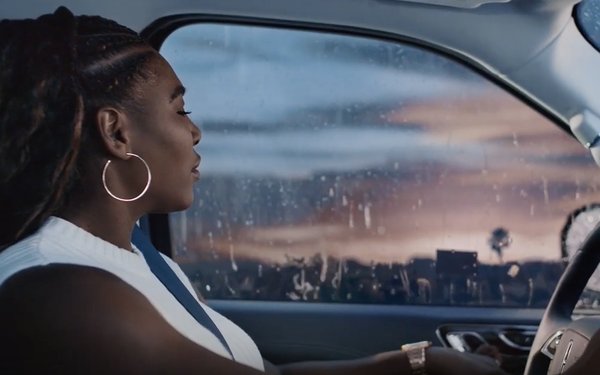 Lincoln Motor Company will debut a spot on Sunday during the Grammy Awards showing tennis icon Serena Williams inside a Lincoln Navigator SUV. A 60-second spot, “Sanctuary,” shows the new mom relaxing in the vehicle’s comfortable cabin during a rainstorm. She turns on the audio system and we hear Sarah Vaughn’s rendition of “Make Yourself Comfortable.” As the track plays, Williams seemingly takes direction from the song and begins to recline her seat, engage the massage feature and enjoy the music and the percussive notes of the rain bouncing off the vehicle. While the interior of the vehicle is a focus, the music Williams plays is relevant, the company notes. Vaughn is Grammy royalty, having been nominated nine times, winning the lifetime achievement award in 1989 and inducted into the Grammy’s Hall of Fame a decade later. Lincoln also has a history of launching notable creative on music’s biggest night. The spot is supported with digital through NBCU and Billboard online, as well as on Lincoln’s own brand/social channels. Williams is one of Lincoln’s “authentic brand ambassadors,” according to the Ford Motor Co. luxury brand. She first appeared on behalf of the brand via digital content in support of the Navigator launch where she talks about her first Navigator, which she named Ginger. Lincoln will also use the Grammy platform to celebrate its heritage and recognize the brand’s namesake, President Abraham Lincoln, days before his birthday on Feb. 12 . A previously digital-only campaign, “Namesake,” will make its broadcast debut on Sunday, again supported by digital on Lincoln’s brand/social channels. Both spots are from AOR HudsonRouge. 3 comments about "Lincoln Debuts Grammy's Spot Featuring Serena Williams". Charles Jamison from Footsteps, February 11, 2019 at 2:44 p.m.
Jonathan Hutter from Northern Light Health replied, February 11, 2019 at 3:16 p.m.
That assumes the copywriter has no role in the concept and creation of the idea itself. I would hope they do. Charles Jamison from Footsteps, February 11, 2019 at 4:05 p.m.
As a former copywriter I pray that was the case.